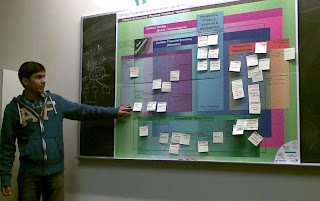 Wednesday Nov 21st, Prof. David Johnston, my principle supervisor of my thesis committee, invited me to talk with his York University Schulich School of Business Operations and MIS masters class SB-OMIS6700 on the Management of New Technology about the focus of my resource: my Strongly Sustainable Business Model Canvas (SSBMC). I realized this was the 16th "outing" that the SSBMC has had since it was born back in the Summer of 2011. The SSBMC comes from the realization that Alex Osterwalder's wonderful and increasingly well known Business Model Canvas (BMC) makes a major implicit assumption: it assumes you want to design a monetarily profitable business model. This is great, but ignores all of us interested in generating social, environmental and monetary profit! (See this post for more on Strongly Sustainable Business Models). 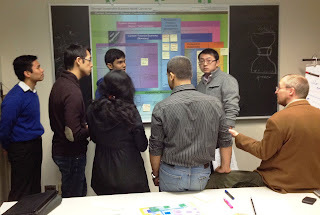 Wednesday's outing was also the 2nd opportunity to see how the SSBMC performs in a "visual design mode". 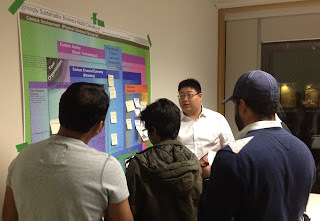 The first design mode outing was at the April Design with Dialogue workshop on "Business Model Innovation for Social Entrepreneurship" where the focus was the design of the business model for the NGO "New Comer Women's Services Toronto" using a summarized canvas. This 2nd outing used the full colour canvas with an engaged and enthusiastic group of masters students who were looking at designing the business model for the launch of an innovative fresh produce packaging technology SmartPac produced by FreshTec. This technology enables produced to be picked later (enhanced taste and nutrition) with less spoilage and shipped for longer periods (i.e. lower carbon footprint since produce can be sent by ship not air). All this in Harvard Business School Case Study 9-511-059. 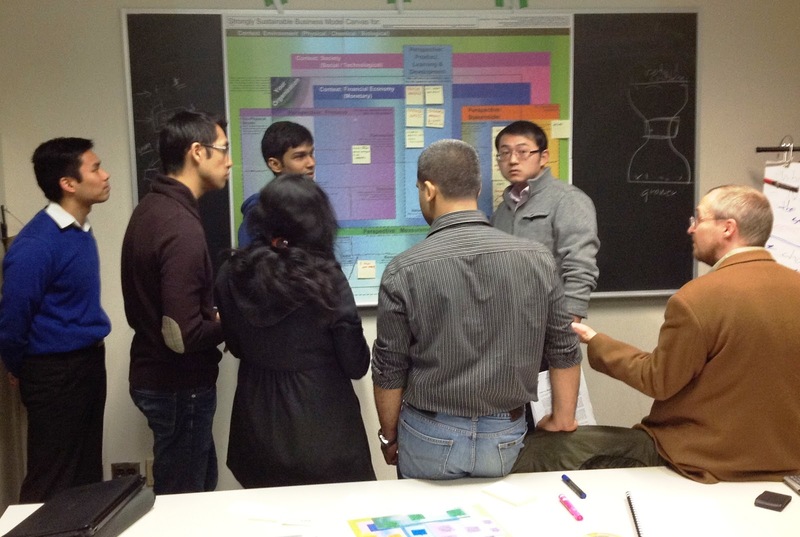 I asked the students come having watched this talk by Alex Osterwalder "a new approach to designing business models" (slides) using his now well known Business Model Canvas (BMC) as well as reading the case. We also watched this 2 minute video about the BMC. The question I asked was: does the BMC have include all the concepts required to describe the possible FreshTec business models? 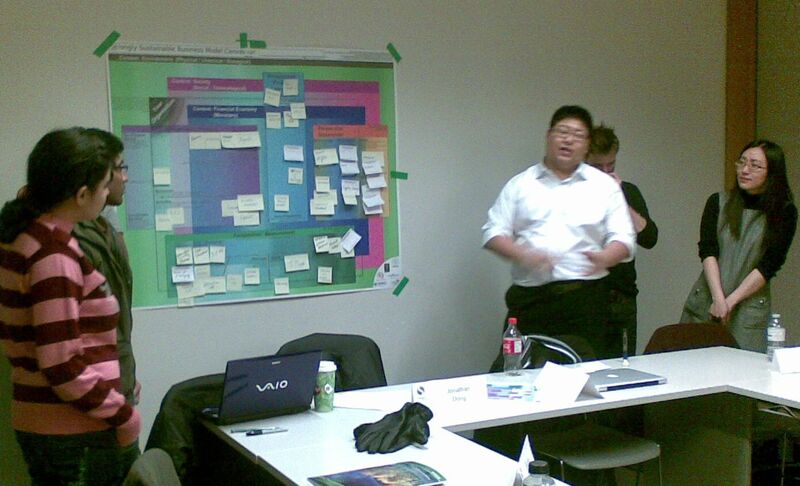 needed for the FreshTec business model? describe non-financial aspects of profit, revenues and costs, how to describe the relationship of a firm to broader society and the natural environment. 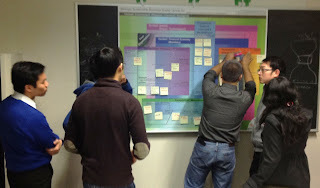 After a quick introduction to my SSBMC and some coffee, David and I let the students loose with the sticky notes! A key question: who pays? ...although some noted this could just be lack of time to learn more about the terminology and needing more time to practice. "Really helped connect the dots"
"We could see the whole thing"
"Made us think about the context for what we were doing - economic, social and environmental"
"Helps make sure you don't forget something"
"Great for a first brainstorming session - saves time"
One aside: Of course no discussion about how increasing international trade in produce might decrease resilience by discouraging local food production... but that's the reality is many of today's business school case studies! (see an introduction of the alternative here). A good evening! Thank-you everyone... invaluable. 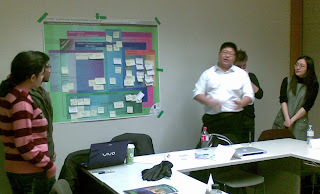 Workshop with Design with Dialogue participants to redesign a Toronto based NGO in May 2012. 2 case studies with CxO's of two small / medium businesses in Southern Ontario in April and May 2012.
Review with noted sustainability business case expert Dr. Bob Willard and The Natural Step Sustainability Advisor Brendan Seale in June 2012 Review with a group of a dozen or so Certified Management Consultants in September 2012. I recommend you look at this case in study project, for some advises.